Mari Herreras Paula McPheeters: "Working in South Tucson with Ochoa children and families has been a calling—my heart's desire, and I'm full of gratitude for the privilege." It was billed as a cafecito to meet the new Tucson Unified School District superintendent, but it ended up being an opportunity for H.T. Sanchez to meet the community that's taken on the district a few times in the past and has always won. In a packed meeting room at the John Valenzuela Youth Center on Wednesday, July 17, Sanchez mingled with parents, teachers and other South Tucson activists who've been involved not just in keeping Ochoa Community Magnet School open, but also in calling attention to the need for the district to keep a place for small neighborhood schools. Cesar Aguirre, an Ochoa parent and organizer, introduced the superintendent, who spoke formally to the group after mingling with people during a dinner served by volunteers. After Sanchez spoke, telling the community he was thankful for the chance to listen to their concerns, he answered questions on curriculum and standardized testing—and whether Ochoa parents and teachers will continue to be worried every few years that TUSD will put the school on the chopping block. In 2008, Ochoa was one of 10 schools fighting to stay open following a proposal by then-Superintendent Roger Pfeiffer. At a rally to keep the school open, several hundred people showed up, mostly students and parents. They surrounded the school in a human chain while school board members held a public hearing inside to determined the school's fate. Back then, all the schools proposed for closure got a reprieve when the district hired Elizabeth Celania-Fagen and she announced that no schools would be closed until she had a chance to investigate the situation. Her fix for the district was to give low-enrollment schools a chance to turn things around. Schools were encouraged to put together a plan and even design a new curriculum model. That's what Ochoa did at the time—developing what is called Reggio Emilia-inspired curriculum throughout the school in order to better compete and to increase enrollment. The curriculum includes focusing on creativity, strengthening the role of teachers in understanding students, and increasing collaboration with the community. While Sanchez's comments at the cafecito were well received, it was outgoing Parent and Child Education teacher Paula McPheeters, who has worked at Ochoa the past 10 years and with TUSD for more than 25 years, who received the biggest cheers. McPheeters decided to retire this year and won't be returning to her classroom to work with preschoolers and their families. As McPheeters went up to the podium, several people in the audience turned to the crowd to encourage more applause and get everyone on their feet. "Working in South Tucson with Ochoa children and families has been a calling—my heart's desire, and I'm full of gratitude for the privilege," McPheeters told the crowd. However, McPheeters quickly got to the heart of why she's retiring, explaining that she feels pushed out "by the continuing top-down policies in public education—at the district level EEI (Essential Elements of Instruction) and now at the national level with the common core (curriculum) and the massive testing that will accompany it. Locally, there's a need for greater democracy in our district that would include the voices of teachers and families who challenge the mandates ..."
Sanchez then told the audience that more teachers like McPheeters were needed and he wondered out loud how he could get her back. 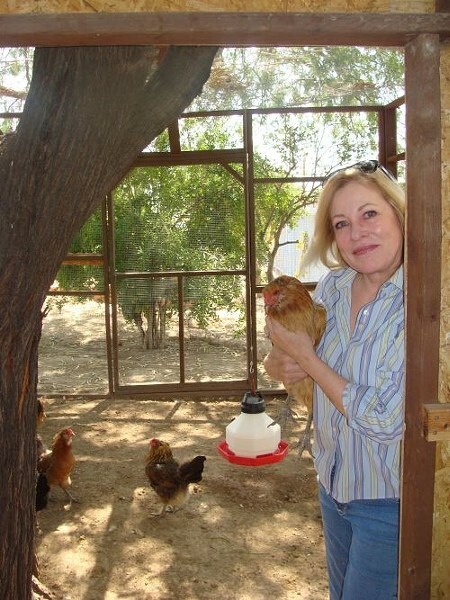 Sitting outside the chicken coop in the school's garden, the Tucson Weekly recently discussed the outgoing teacher's ideas on how Sanchez could help keep popular teachers in TUSD. "If that happened, then I'd say, I'm back." McPheeters said that what troubles her the most at the moment is that the South Tucson community has been constantly worried for the past five years that its beloved school will face closure. Two years ago, the school's test scores resulted in a D grade overall and the next year, a failing grade. McPheeters said she began to notice a change in how the students were being taught. It was all about the tests, and teachers were spending more time inputting numbers into a computer than they did teaching and focusing on the curriculum model that the school embraced, which helped increase its enrollment. At the end of this school year, the school's principal announced that her contract was not going to be renewed because of the past grades. But then new test scores came in. The school was given a B and was just 11 points away from an A. The principal was offered a new contract and decided to stay. "I happen to think the work I do with families, the home visits—thinking about some of the unique struggles that families have here—is far more valuable than spending hours at the computer plugging in numbers," McPheeters said. The testing mania, as she described it could end up creating a Catch-22 situation for the school and possibly other schools. The new curriculum model the school adopted in 2008 helped increase enrollment, but McPheeters said the new emphasis on testing has caused some families to leave. "Some people are going to say about the test scores, 'Fantastic and they did it in a poor community,'" McPheeters noted. "Never mind that kids are bored out of their minds. For me it is heartbreaking. "What may continue to happen is that test scores will go up, the student population will go down and we will find ourselves in the same situation that we were in 2008, being told we need to close because of low enrollment." Sanchez has started a weekly newsletter that goes to TUSD staff, and McPheeters said she was pleased to read about his positive reaction to the cafecito. "I was invited to meet quarterly with the community," Sanchez wrote. "I look forward to returning to share enrollment numbers for the two South Tucson schools, (and) attendance, and student performance information with the community. The passion to take ownership for the neighborhood schools was strong. There is a lot to learn from the meeting. The biggest lesson reinforced by the community gathering is parents and the community served by our schools have a strong desire to be heard and to seek out their part in making TUSD schools succeed." But just in case Sanchez needed a reminder of what he could face if Ochoa comes up again on a school closure list, Aguirre, the Ochoa parent and organizer, ended the cafecito by reminding the community about the power it has. "This neighborhood has shown that it's not just about talk," he said.